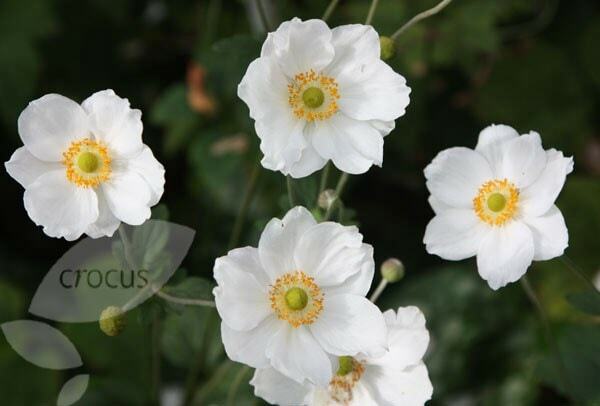 A fabulous plant for brightening up the garden in late summer, this anemone grows in sun or shade and has masses of elegant, cup-shaped, white flowers on tall, wiry stems from August to October. The leaves are vine-like, dark green, and semi-evergreen. These single flowered Japanese anemones are one of the plants traditionally associated with Japanese gardens, where they're grown against dark rocks or in the shade of trees. Best in partial shade, they are perfect for lighting up a dark corner of the garden, or at the back of a herbaceous border. Garden care: Cut back the stalks after the flowers have faded, and tidy up old dead leaves in March. Apply a generous 5-7cm (2-3in) mulch of well-rotted garden compost or manure around the base of the plant in spring. Avoid moving the plant since it resents disturbance. Where necessary, lift and divide congested clumps in early spring. Once again I was very pleased with the maturity & strength of this plant from Crocus. In flower when it arrived & still flowering in the garden..
Refreshes the garden in late summer. Blooms in late summer, a time when my garden begins to look tired, and this reliable anemone wakes it up. The plant arrived well packaged, healthy and of a good size. Currently plant is thriving and I look forward to dividing it and making further plants in a few years time. 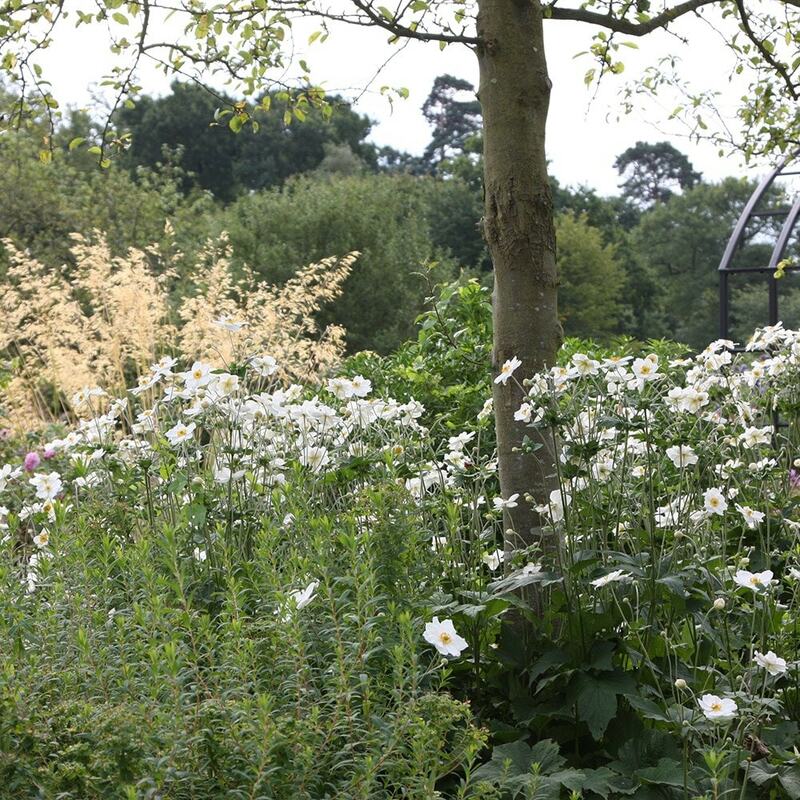 Always a useful plant in the border for later flowering and height. 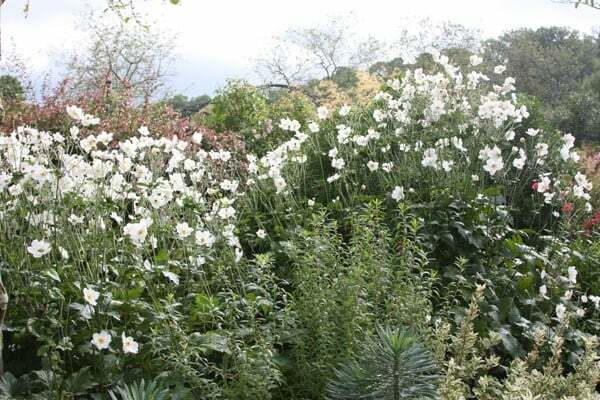 The white flower always light up a border. They light up space - not spreading a lot. Bought this as a gift for a good friend after she admired my pink version. I first had trouble sourcing one, and eventually found this lovely specimen at Crocus around a year ago. My friend was visiting today so I asked her how it was doing. She was delighted to discover it had made it through the pretty extreme weather conditions we have had over the last month or so, and is right now showing growth ready for the season. She loved it last year when it was a relatively new plant too...gave flowers etc. So I really good buy. I bought honorine jobert from you last August and it flowered until first frosts. However is it possible it has changed colour to pink? I have other varieties close by - Queen Charlotte for example but every one is now pink. Is this possible???? I have never heard of this happening, so I wonder if for some reason the 'Queen Charlotte' has spread and the 'Honorine Jobert' has not flourished. I've tried several times to grow these. I'm planting them in a semi shaded border that in the summer gets the evening sun. They're fine when I plant them but don't come up the following year. Is there a best time of year to plant them? These are usually quite robust, however they may not flourish if their roots are disturbed, or if they are not getting enough sun. Hello, I suspect if you cut them back now, it will be at the expense of this years flowers, so it is a bit of a dilemma. Also, as they resent root disturbance, they are best moved only if necessary and in early spring. Hi, I'm wondering whether Japanese anemones would be suitable to grow in the bed (1m wide approx) against the house outside the front of the house. They would be in full sun. If yes, and I planted a line of them at the back, what other plants would go well in front of them? We have iron rich soil (north Oxfordshire). Thank you. ps. I am a novice gardener! Hello, It sounds as though these would do very well in the position you describe, however I would be tempted not to plant anything with them - they have nice, low(ish) foliage and will be happier without the competition. Hello, Now is a great time to plant fully hardy plants (we do have the hardiness rating on all the plants we sell on the site). Scanning through your list though, the only one that is not fully hardy is the Verbena, so I would wait until spring to plant this out,unless you live in a milder part of the country, or have a sheltered garden.